In an extraordinary twist of literary history, Robert Burns, the world-renowned 18th-century Scottish poet, became the ‘people’s poet’ of Russia. In Imperial times the Russian aristocracy were so out of touch with the peasantry that Burns, translated into Russian, became a symbol for the ordinary Russian people. In Soviet Russia Burns was elevated as the archetypical poet of the people – not least since the Soviet regime slaughtered and silenced its own poets. A new translation of Burns, begun in 1924 by the Jewish writer Samuel Marshak (1887–1964), proved enormously popular, selling over 600,000 copies. This CD contains settings of some of Burns’ best-loved poems, including ‘Comin thro’ the Rye’, ‘MacPherson’s Farewell’, ‘Comin thro’ the Rye’, ‘My love is like a red, red rose’, ‘John Anderson, my Jo’ and ‘Auld Lang Syne’. Vassily Savenko and Alexander Blok (a relative of the poet) are renowned for their recordings of Russian songs. 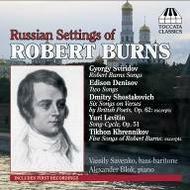 The booklet notes are by Burns authority Andrew Noble, editor of the authoritative The Canongate Burns, and Russian-music expert Stuart Campbell. Full Russian song-texts with English translations by renowned Russian translator Anthony Phillips.